Not everything I make is a home run. Certainly not on the first go-round. I’ll make something and if it has promise, learn, tweak and refine, then make it again. Sometimes, this one is a winner and pictures are taken, but sometimes it’s back to the drawing board for another tweak. Once in a while, something just isn’t worth sharing, and that’s disappointing. We’ll eat it, Orville and I, but we won’t discuss its merits or future potential because it is clear it has neither. But once in a while, I hit a home run. My outfield fence grand slam indicator is Orville’s reaction. When I made Spicy Cioppino Angel Hair Pasta, Orville said (and I quote) “mmmmfl [muffled through a full mouth]…I could eat this every night!” Cut and print! It went up at My Tiny Kitchen the next day. That’s what happened with the two recipes in this post. Orville LOVED them. Now, I may be the self-proclaimed King of Leftovers, but he is decidedly not – that’s probably why I’ve had to become inventive in that department – so when he makes plans to take it for his lunch the next day, it must be a winner. Of course, I was sitting there eating the same thing, and thinking “wow, this is pretty darned good,” but I know I’m too close to the situation to objectively judge, so I rely on validation from others to determine my self-worth…um, I mean… to know if my food is tasty. I’m not that insecure. Really. I don’t need approval to feel I’m a worthy human being. I am enough. Oprah taught me that. But do I really need to know that you love my food? Why else would an attention-starved actor start a FOOD BLOG? TO BE LOVED! (Love me, love my food? What do you mean? Of course they’re the same thing!) Plus it saves on therapy. OK, it seems I am a tad insecure. But that’s to be expected. When I’m onstage I’m sharing a huge part of myself through my work, and when I cook I do the same thing. That’s not just a character up there, it’s me. 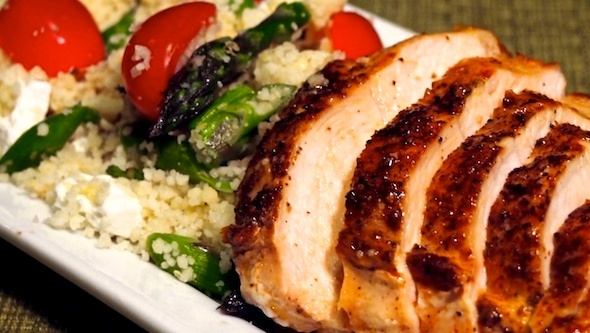 Likewise, that’s just not a chicken breast, it’s me, too. (Well, not really, but you get the idea.) And this time, Orville LOVED my spicy breasts (he says mine are his favorites! ), so here they are for you to partake, too! Enough about me, what about that box of wine I promised you? 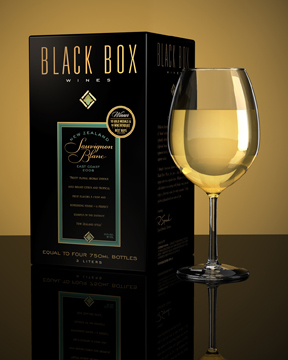 I recently ran across no less than four [one, two, three, four] articles on the merits of a new breed of boxed wine. Oprah’s even weighed in. Tasty wine, from grapes and vineyards, with vintages even, that never oxidizes because it’s in a vacuum-sealed bag that keeps the last glass as fresh as the first, even weeks later! Quicker than the Brita in the fridge! I was enticed enough to give the whole wine-in-a-box thing a whirl. I’ve been experimenting with Sauvignon Blancs that rival some of my favorite SVs from New Zealand – tropical, ripe and refreshing. Call me an unsophisticated hick if you want (you wouldn’t be the first), but it’s darned tasty, and every bit as good as $15-a-bottle SVs I love, and when my current box is depleted, I’m going to try a chardonnay and some jammy reds! Not for nothing, a 3 liter box equals FOUR bottles, and probably closer to five when you factor in the waste when you don’t finish a bottle at dinner and then end up throwing it out. Seriously, if I use a cup or less of wine to make dinner, and then O and I have a generously poured glass each, there still may be another 8 oz of wine left. If we don’t get back to it in a few days, it generally goes down the drain. Do that four times, and that’s a whole bottle wasted. 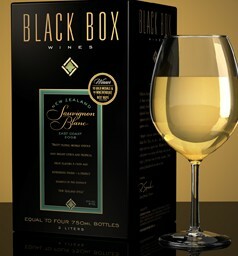 So finding boxed wine that is actually pretty terrific is a double bargain! Plus, I can use wine to cook with even when one or both of us don’t want to drink it with the meal! Yeah, I could use water or broth to deglaze my skillet for a quick pan sauce, but wine is really the thing for that, and having as much or as little as I need without worrying about wasting it is a dream! 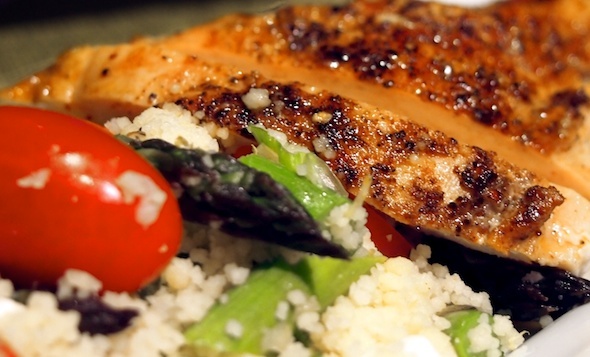 Which brings me to today’s menu: A spicy-smokey chicken breast, pan-seared then roasted to perfection, drizzled with a quick and easy pan sauce, and served alongside couscous tossed with asparagus, tomatoes and tangy feta cheese and bursting with bright lemon and mint! Spicy and cool, side by side, perfectly balanced. Plus, it’s less than 30 minutes from start to finish, so this winner will be on the table faster than a rerun of Friends! Don’t be shy with the seasoning! Pat the chicken dry with paper towels. Season liberally with kosher salt, freshly ground black pepper and ground chipotle peppers. Heat 3 tbsp olive oil in a large skillet over medium heat. 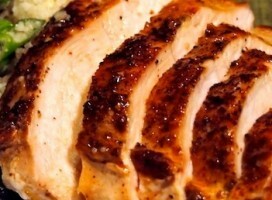 When the oil is shimmering, place the chicken smooth side down (the side that formerly had the skin.) now DO NOTHING for 3 to 4 minutes. Peek under one to see the beautiful browning. Crispy and delicious looking? Great! Time to flip. 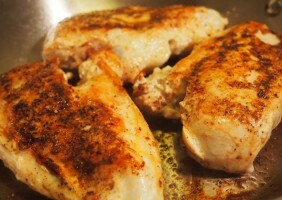 Flip the breasts and cook another 2 minutes on top of the stove, then transfer the skillet to the oven. Get out your instant read thermometer. Depending on the various sizes of your breasts, you may need to take them out at different times. Check the smallest breast at 5 minute intervals beginning at the 15 minute mark. When the thermometer reads 160, take it out and tent with foil. It will rise to the fully cooked temp of 165 over the next 5 minutes. At each interval, check the smallest breast left in the pan, removing and tenting them as they reach the golden 160º. This way, all the breasts, even that runty one that always creeps into the pack, will all be safely cooked to 165º, but will still be tender and juicy. Return the pan with all those beautiful juices to the stove top on medium heat (don’t forget to wrap that handle!). Bring to a boil and add the white wine and use a spatula or wooden spoon to scrape up all the browned bits on the bottom and sides of the pan and stir them into the sauce. Reduce by half, then add the orange juice bring back to a boil. Remove from the heat and which in the butter.Taste for seasoning and add salt and pepper if necessary, but if you seasoned your breasts well enough, this sauce will be perfect as is. Slice the breasts, transfer to a platter and top with some of the sauce. 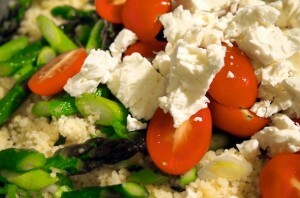 Serve with my Lemon Mint Couscous with Asparagus, Tomato and Feta. The coolness of the lemon, mint and the creaminess of the feta are a perfect complement to the smoky spiciness of the chicken. And the best part is, both of these dishes are even better at room temperture or the next day, and they make a perfect packed lunch! This already looks good together! 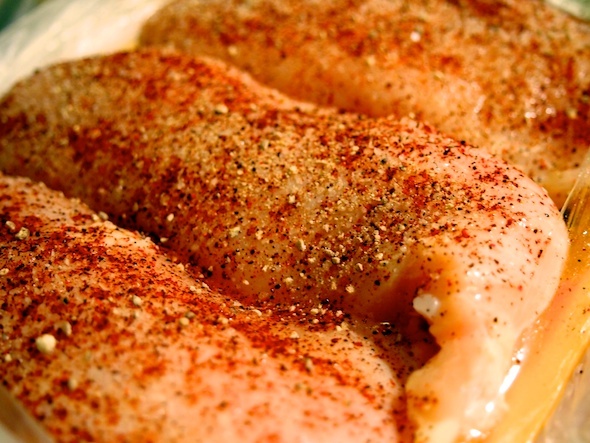 In a covered sauce pan, bring 1 cup of water, 1 tbsp extra virgin olive oil, and ½ tsp kosher salt to a boil. Whisk in the couscous, remove from the heat, cover and let stand for 5 minutes. (set a timer on this one, ’cause it’ll get lumpy if you let it sit too long). After 5 minutes, fluff with a fork to separate the grains, and transfer to a mixing bowl. Add the mint, lemon zest and juice. Toss to combine. In a skillet, heat 1 tbsp olive oil on medium heat. 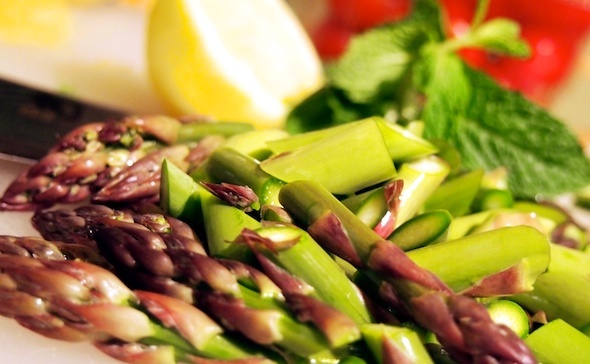 Sauté the asparagus for 2-3 minutes, just until tender. Add the garlic and stir, cooking for 30 seconds. Toss gently, let cool, and ENJOY! Transfer the asparagus and garlic to the couscous. Add the tomatoes and feta cheese, lightly tossing to combine (you don’t want the cheese to disintegrate). Season with kosher salt and freshly ground black pepper. Let cool to room temperature before serving. This refrigerates REALLY well, and the flavors are even better the next day. Just be sure to let it warm to room temperature and fluff with a fork before serving–cold pasta will be a little compressed and the cold suppresses these bright flavors. Letting it warm to room temp relaxes the pasta, and the lemon and mint flavors come alive!